The "Populist Moment": Towards a "post-liberal" Europe? Brexit, the election of Donald Trump, "Who's next?" France? Of course national contexts are specific and differ from one country to another; it is however hard not to associate the vote in the US on 8th November with the British referendum on 23rd June last. Undoubtedly there are also some shared features in the US and the UK which set them apart from continental Europe: both countries were at the origin of the neo-liberal revolution in the 1980's with the rise to power of Ronald Reagan and Margaret Thatcher; it is there that the financial crisis was born with as, its symbols, Wall Street and the City; this is also where social clashes are much more violent than elsewhere, and in all events, more violent than in the countries on continental Europe. However, over the last 25 years the citizens of Western democracies as a whole have been voicing with increasing defiance their mistrust of the political institutions and classes governing their national democracies, and more generally, of the "establishment" and the "system" (comprising the economic, financial, media and intellectual worlds); the feeling of social marginalisation (poverty, exclusion etc.) expressed by the "losers" in terms of international economic opening goes beyond the industrial regions of the American "Rust Belt" and those of the Midlands in the UK., and is also apparent in many countries in continental Europe; beyond the popular classes and the suffering of the most deprived peripheries, there is also the fear of social decline on the part of the middle classes who are concerned about their future and that of their children; last but not least, the issue of controlling migratory flows forms the heart of public debate in many European countries, the terms of which focus on security and identity. The "West" is experiencing a "populist moment" and continental Europe is not being spared this. The argument at the centre of this text is that the various forms of populism - which are feeding a Eurosceptic and even Europhobic discourse - all converge towards a crisis over liberalism which has to be surmounted if we are to prevent our societies from closing on the modern world. What is "populism"? Anti-elitist, anti-democratic or anti-liberal? The various forms of euroscepticism and europhobia that we see emerging in many Member States of the European Union all converge - in spite of their diversity - towards populist rhetoric. "Populism" is not just - as some who are accused of it say - a term and narrative used by the "elites" disdainfully to disqualify the word of the "people". It matches a historical and contemporary reality, the general features of which we are aware. Firstly "populism" reflects the arraignment of the "elite" - be these political, economic, media and intellectual - who are stigmatised because they are said to have stolen or betrayed the power and the will of the "people", the only valid base of legitimate authority. But which "people" are we talking about? In populist rhetoric the people is defined either on a sociological basis, with reference to specific social groups, or on a nationalist basis, but in both cases there is a triple movement towards radicalisation and the exacerbation of the differences which are supposed to be external or foreign to it: from a moral point of view, populists target the "corrupt", from a political and socio-economic point of view, there is the traditional arraignment of the elites and from an ethnic point of view there is an attack made against foreigners. The people is now being mobilised with the aim of reviving the feeling of a lack of representation and identity. And also which elites are being challenged? Are the 16 million Britons who voted to remain in the EU included in these so-called "elites"; if this is the case, social promotion in the UK is truly exceptional! In the US a majority of Americans voted for Hillary Clinton - are they also part of this elite? For their part is the majority of black and Hispanic electorate who voted for the Democrat candidate not part of the "people"? Is Donald Trump not a member of the economic elite? Do a number of those who say they are the candidate of the "true people" in France not belong to the "elites" they are criticising? Saying this does not mean that the "elites" in question do not have to consider the concerns and respond effectively to citizens' expectations, notably those who feel marginalised, excluded and forgotten, but also to the middle classes who fear that they will be socially downgraded. This does not mean either that response should not be given to the strong demand for credibility and competence in our democracies. Finally, this does not mean that we do not have the right to ask our "elites" and all of those who decide and act on our behalf to be exemplary. Beyond the "anti-elitist" element, populism is typified by a type of "anti-pluralism". Indeed the populist criticism of the elites goes together with the supposition that the former holds the monopoly in terms of representing the will of the "true" people ("I am your voice" says Trump). But the freedom of the people does not mean it can be taken hostage before having expressed its will, and democracy supposes pluralism; some authors deduce that undoubtedly "populism even tends to be anti-democratic" and should not necessarily be addressed as a "useful correction" to be made to liberal democracy. Finally populism reflects one of the vital tensions at the heart of the democratic regime - between the principle of popular sovereignty and the liberal principle. It is at this problematic and constantly unstable juncture that populists find for example the source of their criticism of the checks and balances which form the core of political liberalism. On 4th November 2016 The Daily Mail qualified the three judges of the High Court of London as "enemies of the people" after their decision that it was necessary to have Parliament's agreement (whose sovereignty is sacrosanct and forms the basis of British democracy) in order to trigger the process to take the UK out of the European Union. However, we should of course recall that democracy is founded on popular legitimacy, but also on other foundations. Even the institutions that enjoy democratic legitimacy, be this direct or indirect, cannot hold a monopoly over public goods in our constitutional democracies. Similarly believing that only the referendum is democratic leads to an abusive simplification of what democracy is. Indeed submission to popular sanction can lead to a government adopting short term decisions, contrary to the general interest. This has been the basic principle of liberal constitutionalism that has founded our democracies since the end of the Second World War: independent institutions should, in order to protect the minority, serve as a safeguard against the excesses of a government, even if it is democratically elected. History has taught us not to believe that every action taken by a democratically elected government is necessarily legitimate. Independent institutions are a component of our democracies likewise the rule of law that serves as their foundation. The revival of populism is an extremely strong symptom of the political crisis ongoing in Europe and more specifically of the crisis experienced by liberalism. From Denmark and Finland to Hungary and Poland, not forgetting Austria, France, Italy and the UK - the various national elections are confirming the strength of the far right parties and populism (the two not being the same) which are asserting themselves in public debate with a discourse whose core comprises economic and cultural protectionism, not forgetting that of identity. Undoubtedly the reasons behind these developments vary from one country to another and the contemporary forms of populism are multiple: between the return to reality and the national aspirations in central Europe, which sometimes take the shape of authoritarian, illiberal, national-populism, as is the case at present in Hungary and Poland, or even the effects of demographic developments in the ageing societies in the North of Europe, points of convergence appear hard to find. For its part, although Southern Europe is experiencing the rise of the far-right to a lesser extent, this undoubtedly finds explanation in the fact that these countries are protected by the memory of a dictatorial past, which has created safeguards within the electorate against the development of authoritarian forces, even though the populist parties on the left (Podemos in Spain, Syriza in Greece for example) have had some electoral successes in a social difficult context linked to the economic crisis. The phenomenon of political memory must therefore be taken on board, although with Greece it seems that this memory is not guarantee enough. In spite of this national diversity some explanations can be offered to provide coherence to all  of these political developments that converge towards a challenge being made to liberal democracy. Firstly, from an economic point of view, the return of populism is linked to the economic and financial crisis of 2008, in a context in which the parties on the far right in Europe, have increasingly become the voice of social exasperation and anger that has been ignored for too long, which explains the widespread popularisation of their electorate. Beyond this it is linked, from a general point of view, to the feeling of economic destabilisation and fear of globalisation as well as an identity crisis felt by a significant share of public opinion in the context of international opening and the development of "post-industrial" society over the last 25 years. The globalisation of the economy is leading to self-withdrawal, a trend that increases in times of crisis: from a domestic point of view this finds expression in hostility to foreigners and a return to a xenophobic narrative in some countries as a renewed form of the "scapegoat" highlighted by René Girard, since foreigners are deemed to be responsible for the economic and social ills including insecurity; from an external point of view, there is a return to national border controls fired by the refugee crisis and also by terrorist attacks; this hardening of society is reflected in the desire for protection against migration from the East and the South. From a cultural point of view the return of populism in economically prosperous countries (in the Scandinavian countries for example) can be explained by the first signs of increasingly aged societies which are not only typified by economic fears, but rather "cultural" fear linked to the transformation of an environment in which they no longer necessarily identify, which in turn explains the renewed significance of the place of religion - notably Islam - and the practice of religion in European societies. Finally, from a political point of view, several symptoms of a crisis in the principles governing liberal democracy and the rule of law are easy to identify: the exasperation of many citizens regarding financial, tax and corruption scandals that feed "anti-establishment" criticism, which is at the heart of the populist narrative; the development of a narrative in which security is presented as the first of all freedoms, and in whose name the foundations of other freedoms are undermined; relegation of the primacy of fundamental laws to a secondary level etc. More fundamentally the return of populism reflects a crisis of representation which comes in at least two different forms. On the one hand the "system" of traditional representation is struggling to reflect the diversity of old and new splits expressed in society, but which are not necessarily reflected clearly at electoral level. In this context, when many citizens feel that traditional alternation, and even the bipartisan consensus, between parties on the left and the right are not enabling a break from the status quo, deemed untenable, the populist and even extremist parties appear as a means to destroy the bipartisan consensus and the traditional political system as they stand as the only political alternative possible. Moreover the traditional mechanisms of representation - in the strict sense of the term - no longer fulfil their function in terms of "depicting" today's individualist and highly atomised societies, hence the temptation to revive old popular or national heroes, to revive the false feeling of protective identity and or the sense of belonging to a community. Although the European Union is not necessarily a condition for the existence of this populism, it has however exacerbated its leitmotifs: problematic relationship with representative democracy, identity and community, the dialectic of opening and closure, the relationship between freedom and security, threatened Welfare State etc ... From this point of view the weaknesses of today's Europe can be considered not so much as triggers, but rather more as multipliers of certain demands that are at the heart of our democracies, notably focusing on the quest for community and identity, as well as on the demand for equality and social justice and the demand for protection from both the economic and security points of view. If we follow this logic, then the redefinition of the European political project for the long term is a matter of urgency. For several years now the rise of radical and even extremist, eurosceptic, europhobic populist trends, both on the left and the right, has highlighted that there is a crisis ongoing in liberal democracy both from the economic and political points of view. Deregulation has been linked to the financial crisis and tax scandals (Luxleaks, Panama Papers for example). Moreover, political liberalism is increasingly seen to be synonymous to inefficiency and even impotence, notably in the face of other models put forward in the world: a mixed feeling of fascination and fear of the Chinese model; or the attraction for the Russian regime and the model of the strong man who can re-establish order and provide security. Here we should remember the history of the past century and the political projects which, based on a "protective" doctrine, led to "closed societies" and police States in total opposition to the values of democratic, liberal societies. The fall of the Berlin Wall symbolised the triumph of liberal societies. We would be wrong to believe that we are now protected from a return to the past. In which kind of society do we want to live? The crisis of liberalism is reflected in a political crisis of which populism and extremism in many States is a sufficiently evident symptom. The strength of liberal democracy lies however in that it is open by nature to its own shortfalls and its own inadequacies. Given the crisis in democratic legitimacy this implies quite fundamentally the production of a joint vision of the future of Europe in order to offset the deficit in meaning that it is suffering: a community of citizens cannot just live according to law, the economy or regulation; it also, and especially, needs a feeling of belonging to a political community as an area of choice. However, it now seems sufficiently clear that the recent votes in the UK (and in the US) can be explained, in part, by a (counter) policy of "rejection" rather than by the choice of a positive project for the future. In the face of the economic crisis, the proponents of "an open society" must acknowledge that the quest for equality and solidarity in a world open to exchange, are fundamental human demands as illustrated by Thomas Piketty's book on inequality and that they are as legitimate as the aspirations for freedom. Likewise, the freedom of movement and establishment within the internal market are some of the Union's fundamental principles but they must not lead to the provision of services in one market obeying different social and tax rules of another: this is the condition of fair competition and the protection of social models. In the face of the refugee crisis the reception of people fleeing war is a moral imperative and a fundamental right; at the same time the quest for security should also be equally taken into account. With this observation in mind it seems that European liberalism needs to be redefined with the cardinal aim of protecting citizens from the excesses and inadequacies of political and economic systems. And this must rest on the critical acknowledgement of the limits of the organisation principles of our societies, particularly the State and the market, freedom and security. In other words this means rejecting the ideological belief in the presumed identification of one of these principles with general interest. From an economic point of view European liberalism must imply the admission of the limits both of the market and the State. We should recall that this idea was notably initiated by John Stuart Mill in his "Principles of Political Economy". This idea deserves to be pursued constantly. Indeed it is clear that it is impossible blindly to trust the market which can be short-sighted and suffer brutal adjustment. State intervention can be justified by externalities, the asymmetry of information, the need to compensate for economic inequality, for reasons of social justice or the necessary definition of the game rules for the institutions, such as the financial markets, currency and competition. At the same time it has to be admitted that State intervention should not be omniscient and omnipotent. It can be exposed to risks in their extreme forms such as political cronyism, nepotism and corruption. These threats have fed criticism of the elites in many countries and have fostered the rise of populism. Similarly from a political point of view, the respective limits of demands for security, freedom and identity have to be acknowledged. Each is legitimate to a point. Wanting absolute security, wanting the end of uncertainty or risk is eminently dangerous for freedom, because freedom implies a certain amount of indetermination, which is incompatible with the total control of citizens' activities. The demand for security can therefore never be absolute since it would then lead to a closed, authoritarian society. Conversely freedom is impossible if there is not a minimum amount of security, comprising safety, i.e. the fact of not being placed in danger or subject to the arbitrary will of the other, and without minimum social protection. In short by reformulating the first principle of Rawls' social justice, we might say that society's goal should be the quest of greater security and freedom of people that is compatible with an extended range of constitutionally protected fundamental freedoms and minimal guarantees of security. This principle justifies State intervention as part of its regalian tasks that aim to protect public freedom and on their behalf, both internal and external security. As Pierre Hassner wrote on the collapse of the USSR: "We know, out of bitter experience in the 20th century that there is no substitute to freedom and that no system, no State [...] can close to the modern world without experiencing failure or collapse. But we also know that humanity does not live on freedom and universality alone, that the aspirations which led to nationalism and to socialism, the quest for community and identity and the quest for equality and solidarity will resurge always, as they are doing now. It is in the measure that liberalism can integrate and conciliate them both with the freedom of the individual and the interdependence of the planet, that it will have a chance, after winning the Cold War, of not losing peace." In line with this it seems that the European Union must therefore take into account a certain number of demands and aspirations expressed by its citizens which are just as legitimate as freedom: the need for community and identity, response to the social question and economic protection and security. The issue of the European Union's borders is one of vital importance and reflects the major challenges that the Union has to face. What will be the European project be post-Brexit? Where will migration be controlled? How do we respond to the identity crisis that typifies many countries? Moreover, some States consider that their borders and their security are under threat (Baltic and Eastern European countries by Russia in particular), and doubt that the EU would be able to protect them, which is leading either to higher national military spending (Poland for example) or to a stronger integration strategy (the Baltic countries with the adoption of the euro, seen as a guarantee of increased solidarity). The question is crucial: if Russia undertook an aggressive, expansionist policy as it has done in Ukraine against a Member State, what would Europe do? This would be the true test for European borders and its identity. Are we ready to engage the means and to take the risk of losing human life to protect our borders? It is notable that NATO, which has served as a substitute from this point of view, is not necessarily the miracle solution, and this seems to be all the more the case in the wake of the election of Donald Trump as President of the United States: for example what would happen if Turkey, a NATO member was increasingly aggressive towards Greece? The Cypriot situation illustrates the risk of the fait accompli. The thing that links the nations within the European Union together is also that which distinguishes them on the outside. The question of the borders is therefore linked to that of Europe's political and geopolitical identity and involves the sense of belonging across a multinational collective as a whole. We firstly have to reassert the geopolitical advantage of the various "enlargements" brought to European integration in terms of the pacification, reconciliation and stabilisation of the countries on the continent and this, in spite of worrying developments in Central Europe. However, it has to be admitted that unlike the previous "enlargements" those who have joined since 2004 have raised questions - which are not just political-institutional and socio-economic in nature - but which also involve identity, and which have surfaced within several national public opinions (in France, the Netherlands and also Germany and Austria). Beyond the economic (fears of social and tax dumping increased by the crisis) and political reasons (fears of loss of influence), the issue of identity is linked to the geopolitical break caused by the fall of the Berlin Wall. On the one hand, the identity crisis finds its origins in the feeling of an apparent, indefinite extension which has typified an unlimited "Europe" that could not take the question of territory seriously, although this was crucial (limits to security and borders of a community as the framework of belonging and identification). On the other, the geopolitical split that was introduced by the collapse of the USSR 25 years ago, has brought a singular feature to light: contact with the periphery of the European continent where work of clarification, albeit temporary, of the territorial limits of the European Union is vital. In a context like this it is urgent to initiate joint political thought into the limits of the European Union. This major political issue has been avoided for too long under the pretext that it divided Europeans (notably regarding Turkey and Ukraine). Not asking this question, which is weakening acceptance of the European project, is tantamount to not responding to the malaise of public opinion. Tocqueville stressed that not only is democracy a form of government but also a "form of society" whose principle lies in the aspiration for "the equality of conditions". With the crisis the need to develop the social aspect of the European Union has become evident. 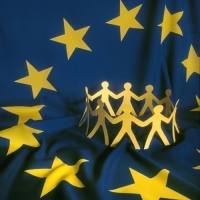 European integration is regularly criticised because it lacks social dimension. However, it is already an area of solidarity. Access to the internal market has been a vehicle for economic catch-up in many countries, for example in Spain, Ireland and also in Central and Eastern Europe, as illustrated by growth and the per capita GDP in these countries since their accession to the European Union. Moreover the deepening of this market has gone together with unprecedented financial transfers as Europe has integrated: the CAP (40% of the budget) which was a success in the past but which is now no longer the case, has to be reformed; and the regional and cohesion policies to the benefit of the most vulnerable countries and regions which represent a good third of the Union's budget. In addition to this, as a factor of the stability of Monetary Union, the euro zone crisis has made financial solidarity with its Member States indispensable: in all, and taking into account the funds allocated to Spain to consolidate its banking system, the total sum of European intervention on behalf of euro zone financial solidarity rose to nearly 430 billion euros at the end of 2012. Beyond the demand for "financial" solidarity in the strict sense of the term, the European Union must now also take into account the need for social cohesion that is vital for a stable society. Europe is typified by major social heterogeneity. Even though we have to reduce the gap between fact and fiction in this area, the examples of social competition, that are sometimes aggressive, have now been proven by the facts, notably in the food sector, transport and also in the construction industry. This is precisely the context of the present revision of the posted workers directive, the control of which has to be strengthened. Moreover, due to the crisis, unemployment has risen sharply in Europe. It has also reminded us of the structural fragility of some categories of population whose inclusion in the labour market is weak: young people (under 25's), the seniors (over 50's), temporary workers and single working mothers. Although strengthening the European Union's social dimension, and notably in the euro zone, has become clear the "social" debate is still difficult at European level for several reasons. Most of the competences in this area are still national and the 28 Member States have different traditions and histories; action in this area therefore means taking into account the subsidiarity principle and deciding who is doing what. Moreover, not all of the Member States interpret the same word in the same way: redistribution, management and the organisation of labour relations, individual protection of people at work; the fight to counter discrimination. The discourse regarding "Social Europe" also often goes unheard. For example it is not by adopting the principle of the European "minimum wage" that we shall magically reduce wage differences. With this said, the adoption of measures in the social area, notably aiming to support workers who face sometimes brutal economic and industrial change, is vital except if we want the idea that Europe does nothing for its workers to grow ! The need for a "regalian Europe"
Although the European Union, as it has been built by the States, has a certain number of tools to ensure the good functioning of the markets (notably via its prerogatives in terms of competition, internal market regulation and the monetary area), it has to be admitted that there are weaknesses in several areas, notably in "regalian" areas. In particular, its ability to contribute to the stabilisation of economic cycles in the budgetary area and even its role in maintaining security and the rule of law (for example in the fight to counter corruption, anti-terrorism, defence and border protection) are extremely limited because the Member States do not want to grant its powers in these areas. The European Union was built with the Member States' refusal to grant it these "regalian" missions since they wanted to protect their sovereignty. The EU institutions therefore found themselves helpless in the face of the economic crisis and the request for increased rule of law and security policies. Hence, it is not surprising that many protest parties have been as critical of EU's action as they have been regarding their national policies. This type of observation reveals the foundations of a European project that can provide its citizens with greater protection and leads to the question of how to undertake missions that aim to protect public freedom at European level and also internal and external security on their behalf. There is also an economic dimension to this. Trade negotiations provide an example. In the modern world growth sources lie largely outside of Europe due to demographic dynamics and economic catch-up, but also because many technological innovations are being distributed and making profits on a global scale. In this context protectionism is only that in name. However, this does not mean that Europe should not defend its interests and collective preferences. It notably implies the demand for reciprocity, for example in terms of implementing the principles of the market economy, the protection of intellectual property, public procurement and export guarantees. This also supposes guaranteeing that trade treaties do not endanger directly or indirectly (unmonitored dispute regulation mechanisms) existing European consumer protection measures, whether this be in the areas of healthcare, agriculture, environment or finance. Finally this demands that Europe has the tools that are as effective as any American instruments to ensure the respect of its rules, for example, in terms of taxation, finance and the monitoring of technical standards. Beyond the simple aspects of trade or consumer protection, the domestic basis of regalian power is the ability to levy taxes that is being undermined by evasion, fraud and tax optimisation. The latter also endanger social justice, since they create inequality between taxpayers, households and businesses some of whom cannot avoid paying their taxes. The extremely wide support enjoyed by the Commission in the Apple affair and the rapid adoption by the Council of the Commission's legislative initiatives have highlighted the need for strong European action in this area. Indeed the project matches Europeans' expectations: 82% of them want greater intervention by the European Union in the fight to counter terrorism, 75% in the fight to counter tax fraud, 74% in terms of migration, 71% regarding external border protection and 66% in terms of security and defence. The theme of regalian Europe enables a shift in the debate over sovereignty. A regalian Europe is one that strengthens the sovereignty of the public authorities, whether it is exercised at national or European level. The European Union and the States of Europe, under the democratic, liberal model in which we operate, have the same raison d'être: to protect citizens' security both physically and economically and, at the same time, provide as wide a space as possible to individual freedom. Maintaining open borders and protecting European liberal values implies the creation of a regalian Europe, without which we risk ever greater national withdrawal. Yet it is likely that the latter will provide further problems rather than more solutions. In particular renationalisation would not protect us from phenomena that are greater than the nations themselves: it would not stop migrant flows, it would not heal economic weaknesses, it would not make politics more ethical and it would not end terrorist threats. This entails rather more the definition of policy content and the dividing lines which cross national debate on these issues. Finally national withdrawal would not heal European differences; it would be quite the opposite. Bitterness toward "Brussels" would transform into rancour against neighbouring European States, which would take on the periodically recurring role of scapegoat they had prior to European integration. A return to "national Europe" would mean a return to the political divisions that European integration has not erased, but whose containment it has managed with checks and balances. Fighting populism ultimately means re-creating a vision and a meaning, i.e. a long term political project. This has to be the reconstruction of a uniquely European political model of continental scale that can take on board a certain number of inevitable demands: responding to the crisis of meaning, to the requirement of solidarity and the fight to counter inequality, to recreate the feeling of belonging via the quest for community and identity, and finally to respond to the demand for economic and social protection and also security. From an external point of view this political project has to be made "competitive" in the world race between different political and socio-economic models. It is only by responding to European expectations as expressed by the populations that the latter will find their place again in a changing world. It is only by being confident of their principles that they will cease to be on-lookers and become fully-fledged actors in globalisation. This is the condition for Europeans to overcome their disarray and to find a renewed feeling of freedom. This text takes up and develops ideas that were initially published in "Euroscepticism and Europhobia: the Threat of Populism" in The Schuman Report on Europe. 2016, Lignes de repères, 2016 and in with Jean-François Jamet, in Commentaire, n°155, Autumn 2016. I thank Yves Bertoncini for his advice on this point during our discussions of the issue. For France see for example Laurent Davezies, La crise qui vient. La nouvelle fracture territoriale, Le Seuil, 2012 and Christophe Guilly, La France périphérique: comment on a sacrifié les classes populaires, Flammarion, 2014. Cf. Louis Chauvel, La spirale du déclassement, Le Seuil, 2016 and Les Classes moyennes à la dérive, Le Seuil, 2006. Cf. Pascal Perrineau, " Europeans and Migratory Issue", The Schuman Report on Europe. State of the Union 2016, Lignes de repères, 2016; and Wouter Van der Brug, Meindert Fennema, Jean Tillie, "Anti-immigrant parties in Europe : Ideological or Protest Vote? ", in European Journal of Political Research, 37, 2000, p. 77- 102. V. Gérard Grunberg, " Le peuple, quel peuple ? Les élites, quelles élites? ", Telos, 14th November 2016. Cf. Jan-Werner Müller, Qu'est-ce que le populisme ? Définir enfin la menace, Editions Premier Parallèle, 2016. See Cas Mudde and Cristobal Rovira Kaltwasser (eds. ), Populims in Europe and the Americas: Threat or Corrective for Democracy? New York, Cambridge University Press, 2013. Yves Mény and Yves Surel, Democracies and the Populist Challenge, New York, Palgrave, 2002. Populism is not necessarily incompatible with liberalism in all evets as far as its economic component and its "neo-liberal" variation are concerned, as shown by some examples I Latin America where neoliberal populism has been discussed. Cf. Kurt Weyland, "Neopopulism and neoliberalism in Latin America: Unexpected affinities", Studies in Comparative International Development, 31/1996, p. 3-31. Cf. Bernard Manin, " Les deux libéralismes : marché ou contre-pouvoirs ", in Intervention, n°9, 1984. Catherine Audard, Qu'est-ce que le libéralisme ? Ethique, politique, société, Paris, Gallimard, 2009. See Samuel Issacharoff, Fragile Democracies, New York, Cambridge University Press, 2015. Cf. Pierre-André Taguieff, La revanche du nationalisme. Néopopulistes et xénophobes à l'assaut de l'Europe, Paris, PUF, 2015. Thierry Chopin and Jean-François Jamet, " L'Europe libérale en question ", Commentaire, n°134, Summer 2011. Cf. Pascal Perrineau, "L'irrésistible ascension des nationaux-populismes en Europe?" in Y.-C. Zarka, P. Perrineau, A. Laquièze (dir. ), L'Union européenne entre implosion et refondation, Editions Mimésis, 2016, p. 143-155. Timothy Garton Ash, "Populists are out to divide us. They must be stopped", The Guardian, November 11th 2016. Cf. Daniel Cohen, Trois leçons sur la société post-industrielle, Le Seuil, 2006. René Girard, Le bouc émissaire, Grasset, 1982. See Dominique Reynié, Populismes : la pente fatale, Plon, 2011. This mechanism clearly applies to "consensus democracies" - Austria, Belgium, Netherlands etc. - that A Lijphart and J.T. Hottinger called "Consociational Democracies", in Revue internationale de politique comparée, vol. 4, n°3, 1997, p. 529-697. But this also applies to majority political systems as in France where the rise of the Front National can be explained when many citizens say that they feel that they have "tried everything". Pierre Rosanvallon, La contre-démocratie. La politique à l'âge de la défiance, Le Seuil, 2006, p. 269-277. See Abram N. Shulsky, " La démocratie libérale : victorieuse et assaillie ", Commentaire, n°148, Winter 2014-2015 and Pierre Manent, " La crise du libéralisme ", Commentaire, n° 141, Spring 2013. Ivan Krastev speaks of the "democracy of rejection " to qualify the present global politics of protest, in Democracy Disrupted: the Politics of Global Protest, Philadelphia, University of Pennsylvania, 2014. John Stuart Mill observed that "in economy, laisser-faire should be the current practice and one should only steer away from this when it is necessary to achieve the greater good. This maxim is undeniably sound as a general rule but there are many and very clear exceptions to this" (J. S. Mill, Principles of Political Economy, 1848). Mill provides examples, particularly consumer protection and contract law. Cf. Philippe Aghion and Alexandra Roulet, Repenser l'Etat, Paris, Le Seuil, 2011. John Rawls, A Therory of Justice, The Belknap Press of Harvard University Press, 1971. Pierre Hassner, " L'Europe et le spectre des nationalismes ", Esprit, October 1991 ; taken up in La violence et la paix, Paris, Le Seuil, 1995. Michel Foucher, Le retour des frontières, CNRS Editions, 2016 and L'Obsession des frontières, Perrin, 2007. As pointed out by Vaclav Havel: "in history, Russia has spread and retracted. Most conflict are started by disputes over borders and in the conquest or loss of territory. The day we calmly agree where the European Union ends and where the Russian Federation starts, half of the tension between the two will disappear." Those who advocated Turkey's accession succeeded in eliminating the issue of "Europe's borders" from the focus group's mandate on " Europe in 2030 " that the former head of the Spanish government Felipe Gonzalez chaired in 2010. For a modern reassessment of this thesis, cf. Pierre Rosanvallon, La société des égaux, Paris, Le Seuil, 2011. See Jürgen Habermas, "Democracy, Solidarity and the European Crisis", speech given at the University of Leuven in the Netherlands 26th April 2013. In 1990, GDP/capita in Poland and Ukraine were similar. 25 years later the ratio was 1:4. Cf. Gilles Lepesant, "2004-2014: review of a decade of enlargement", European Issue n°311, Robert Schuman Foundation, April 2014. G. Esping Andersen, The Three Worlds of Welfare Capitalism. An essay on modern capitalism, Princeton University Press, 1990. The strengthening of the Adjustment Funds to globalisation is vital in this respect. V. Thierry Chopin, "Pour une Europe régalienne", Le Monde, 30th June 2016. As of 1954, France rejected the European Community of Defence. Cf. Anne-Marie Idrac, "Trade Policy: To Arms Europeans!" in the Schuman Report on Europe. State of the Union 2017, forthcoming. Cf. "The European s in 2016", Eurobarometer special by the European Parliament June 2016.